contribution to its owner’s independence. by the South-West German region of Baden Württemberg. A manual wheelchair with extra thrust. radius of action and unprecedented durability are guaranteed. benefits of full battery power! It takes just a few small brackets to fix the drive wheels to the frame of the chair. assisted – is always available in other words. The new ECS combines therapeutic benefit with individual adjustment. 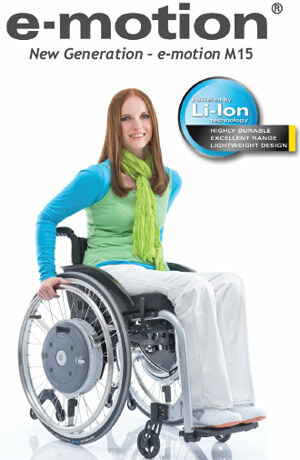 – precisely adapted to each user’s personal mobility restriction and needs. Ideal for out and about. action that adds to the enjoyment of outings or holidays. disconnected from the wheel and carried separately. Click the button below to add the Alber E-motion to your wish list.